“First Things First”, as common saying says, goals give you direction and can provide peace of mind. With all the marketing bombarding us every day and fueling our wants, a set of goals helps us to say no. They remind us there’s something we want more than the tempting purchase right in front of us. Even when you have written savings goals, it takes a lot of willpower to consciously stash away money each month. We humans are hardwired to consume immediately. So, saving for future needs and wants goes against our nature. That’s why saving toward goals must be automatic, moreover when we are thinking of short-term savings. You put money toward priorities first [the short-term saving], and then you’re free to spend what’s left on daily living. In that way, having goals is freeing. Back to the automatic saving, by setting it automatic, you don’t have to be constantly wondering if you’re doing all the right savings things and feeling guilty about indulging in small daily purchases. Automatic savings leads automatically to lower spending. Erecting these artificial boundaries for money is useful. Open separate bank account for each saving [emergency, car and seasonal fund] and set automatic deposit. Don’t be shy about opening separate bank accounts for each of your short-term goals. Of course, you want accounts that won’t charge you any fees. It’s true that opening more accounts slightly complicates things because you have more accounts to keep track of. But it’s well worth it because you’ll be very clear about what your short-term spending goals are and how you’re funding them. It’s similar to the simple envelope system for daily spending, with one envelope containing money for food, another for clothing, and so on. If you’re going to be stashing cash in separate accounts, it would be nice to earn a little interest on the money. An Online savings account is a great choice. Go with whichever online account happens to be paying a higher interest rate than the others at the time you look at them. Opening an online account is fairly easy. Follow instructions on the Web sites, and fill out forms. You will have to electronically link a personal checking account to the savings account to make automatic deposits. Whether you call it a a cash cushion, breaking glass fund, rainy-day fund, or an emergency fund, having cash available for when bad things happen is fundamental to financial planning. We talked about the most serious scenario, having cash to live on if you lose your job. Other reasons include life’s expected-but-unexpected cash drains. We don’t know when they’re coming but cash outlays for such expenses as car repairs, medical bills, and plumbing leaks are coming sooner or later. Without the cash to pay for these, you’re likely to put them on a credit card and rack up finance charges. That just makes those “emergencies” more expensive. With a cash cushion, you can feel comfortable saying no when a salesperson offers you an extended warranty. Why? Because you have the money to pay for the repairs if the item breaks. Emergency fund is cash equal to three to six months of “bare-bones” expenses, meaning enough money to pay rent or mortgage, food, utilities, transportation, insurance, and so on. “Why?” you asked…. Because in a financial crisis—think, losing your job—you should immediately cut back on nonessential spending—no going out to eat, no clothing purchases, and no golfing. You could even start canceling your gym membership, your cable TV service, and your fancy hairdresser appointment. The point is you need a cushion to pay for necessary expenses, a total far less than expenses during flush times. It depends on your circumstances. For example: two-income families have less of a need for a large emergency fund, especially if both earners make about the same amount of money. That’s because a job loss, among the most serious of emergencies, doesn’t wipe out the entire household income. A one-income family needs a larger contingency fund. 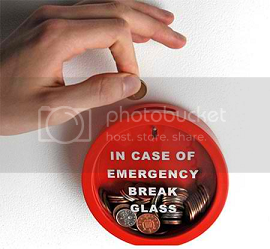 The size of the emergency fund can also depend on your financial commitments. People with a paid-off house and no car payments might get by with a smaller cushion. This, by the way, is yet another reason to keep debt at a minimum. Creating a rainy-day fund can be a two-step process. Although the long-term goal is a fund equal to three to six months’ worth of bare-bones living expenses, a shorter-term goal might be to stash away $2,500. At that point, you haven’t protected against job loss, but you have given yourself financial breathing room when the car and the clothes washer break down at the same time. Make the $2,500 emergency fund a high-priority goal. Fully funding the cash cushion can be balanced among your other financial priorities. For example, it would take a backseat to paying off high-interest debt. Establish a home-equity line of credit. Homeowners could count home equity as part of their temporary emergency fund. A home-equity line is an open credit line against the equity you have built up in your house. It’s cheap or free to open a line of credit, and you pay no interest unless you use it. If you use it, the interest you pay is likely to be tax deductible. All that said, however, a home-equity line is not a good choice for compulsive spenders who will use the credit line for nonemergencies. Improving your credit score will increase the chances of being approved for an equity line. Raise your credit card limits. Using high-interest credit cards is a very common but lousy way to address a financial emergency. If you’re responsible with credit cards and rarely carry a balance, however, it couldn’t hurt to ask your card company to raise your limits if you do it the right way. You must ask them to raise your maximum charge limit “without pulling my credit report.” That way, the request will not damage your credit rating. In fact, it could help your credit rating if you’re successful because part of the credit score is based on the amount of used credit compared with the amount of available credit. A second advantage is the higher limit gives you a source of cash during a temporary cash-flow jam. Consider nonretirement investments. Your regular investments outside of retirement plans might be mostly held in volatile stocks or in accounts that might charge an early withdrawal penalty, but these can be sources of emergency cash. True, using these funds in an emergency might force you to take an investment loss, but addressing a true crisis is usually more important. If you consider withdrawing a retirement investment, review with your plan administrator all the disadvantages of loans and withdrawals before going ahead. Evaluate the bank of mom and dad. Borrowing from relatives or friends is dicey at best, and should probably be among the last resorts in a crisis because it has ruined many relationships. But it could be a source of emergency money. One idea is to formalize such a loan by writing down the terms. All that said, it is a source of cash if you’re desperate. But consider this my attempt to nudge you away from this option. In short, you need a rainy-day fund and a plan to access cash in a financial storm. It will, indeed, rain. It’s just a matter of when. First, people lust after cars they can’t afford which leads to five-year loans or longer and ridiculous leases (which is redundant because almost all leases are a ridiculous choice for people concerned with spending money smarter). People concentrate too much on the monthly payment, instead of how the purchase fits into their financial life. For the record, I’m obligated by all that’s good and true in personal finance to urge you once again to buy a slightly used vehicle. That way, you avoid much of the new-car depreciation. Second big mistake many people make is not putting down much money when buying a vehicle—or worse, rolling the payment of a previous vehicle into the loan on a new one. This leads to the brutal situation of actually owing more on a car than it’s worth, or being “upside down.” You can’t sell the vehicle—or, if you get in a bad accident, you can’t total the car—without losing thousands of dollars. I don’t want to get all ridiculous on you, but what if you paid cash for your next vehicle? In fact, I would argue that if you can’t pay cash for a vehicle, you can’t afford it. After you pay off your current vehicle, continue making the same monthly payment to yourself. Do that by making an automatic payment to a separate car-fund account. Then when you go to replace your vehicle, you’ll have the trade-in value, plus cash saved in this account. That total becomes the purchase price of your new car, which you can now buy for cash. At the very least, you’ll have a sizable down payment. Keep your vehicle for four years after paying it off. If you were paying $400 a month, you would accumulate $19,200, plus interest, in your car fund. For simplicity, let’s call it 20 grand. This, by the way, requires no additional sacrifice on your part. You’ve already been paying this $400 a month for several years. If you get $5,000 by selling or trading in your old car, you can now pay $25,000 for a lightly used luxury car of your choosing! Another good idea is to have a separate account when you’re saving for a house down payment. If you already own a house, you might create an account for home improvements, whether that’s new siding, new furniture, or a kitchen remodel. The running theme with any of these short-term savings accounts is to fund them regularly and automatically. That way, you’ll have no trouble achieving those goals.